ALBUQUERQUE, New Mexico — New Mexico lawmakers are facing a hard deadline as agreements that allow a handful of American Indian tribes to operate casinos approach their expiration date. Gov. Susana Martinez’s office has spent the last three years working with tribes to craft a new gambling compact that supporters say would bring stability to New Mexico’s gaming industry, protect jobs and increase revenues to the state. However, some lawmakers say New Mexico is veering off course. Senate Finance Chairman John Arthur Smith suggests the state has deviated from its initial plan nearly two decades ago of trying to strike a balance among horse racing tracks, American Indian communities seeking economic development and the state lottery. Tribes and the public will have a chance Saturday to testify on the proposed compact before the Legislature’s compact committee. Nearly 45 years ago, President Richard Nixon delivered a special message to Congress on Indian affairs. 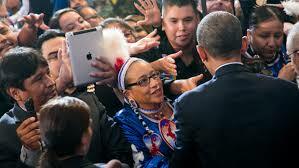 One of his key recommendations was to empower tribes economically. The policy shift was intended to enable tribes to govern their own affairs rather than “terminating” them — a failed policy from the 1950s in which the United States attempted to end its relationships with tribal governments recognized as sovereign. In the decades since Nixon’s message, there have been significant changes — mostly for the better — to embolden tribes in the areas of health, education and business development. But great needs remain because of widespread unemployment, housing shortages and high suicide rates. While progress has been made since 1970, challenges remain, and the potential to slide back toward de facto termination is real. As a result of Nixon’s policy, tribes are recognized as sovereign entities that have the right and responsibility to foster and grow their economies for their citizens. Tribes engage in business ventures on the basis of the needs of and resources available to their communities, and if tribes undertake ventures that utilize local resources and expertise, they are more likely (or at least better positioned) to succeed. Economic growth is essential because many tribal communities have suffered from chronically high unemployment. This is the essence of self-determination: enabling tribes to decide for themselves what works best. Self-determination is critical because cookie-cutter programs lack the flexibility and nuance to acknowledge the diversity of resources and opportunities that might enable each tribe to create its own strong economy. There are some examples of economic successes, such as Ho-Chunk Village, in Winnebago, Nebraska, which has garnered praise for its strong economic growth and has dropped unemployment to approximately 10 percent, down from more than 50 percent in 1994, primarily through government contracting. Its reinvestment of profits to create housing and job opportunities in the community has also drawn praise. But such successes are generally considered outliers in the public consciousness, which tends to view tribal communities as destitute, plagued by high unemployment or reliant solely on gaming ventures. Because of that, the public may not fully comprehend the degree of desperation — and potential for success — embedded in Indian Country today and Congress’ role in its continuance. Though Nixon left other harmful legacies, the ideal of tribal self-determination remains just and powerful. Recent congressional policies regarding Native American communities gravely erode the possibility for economic success through empowerment. Over the past several years, there have been efforts to restrict gaming and opportunities for government contracting as well as strong resistance to the resolution of legal issues regarding Indian land that deters outside investment. There are two distinct problems with Congress’ approach to considering and enacting legislation that affects tribal economic development. First, Congress has largely acted on tribal economic legislation in piecemeal fashion; one hand does not know what the other hand is doing. Instead, Congress and Indian Country need to use a more holistic approach by building consensus around policies that promote continued economic growth in tribal communities rather than tackling individual issues. And legislators need to understand communities’ capital, educational, regulatory and other needs as an entity in order to provide the best chance for success. Second, in recent years, there have been more deliberate efforts to restrict programs or authorities that facilitate various economic opportunities for tribes. As tribal enterprises grow, so does congressional attention to tribal businesses and, increasingly, proposed policies have emerged that would hinder growth. For instance, efforts to restrict tribal gaming — particularly off-reservation gaming — have been obstacles for at least a decade. In addition, efforts to take away provisions in federal contracting programs that provide unique participation of businesses owned by entire tribal communities would undermine Native American communities that do not have significant gaming resources and thus must find other economic ventures. The proposed changes would treat Native American community-owned businesses (providing for hundreds or thousands of people) the same as individually owned businesses for purposes of qualifying for federal small business programs. But these programs work well. Gaming and federal contracting programs account for more than $35 billion in revenue to tribal communities, which is a large sum, though nowhere near enough to meet the needs of 566 communities across the country. Third, the Prevent All Cigarette Trafficking Act significantly diminished tribal tobacco manufacturing and distribution on reservations. The law prohibits tobacco distribution through the U.S. Postal Service, making it extremely difficult to process tobacco sales made through the Internet, a niche in the market where tribes and individual Native Americans were particularly successful. When it took effect in 2010, the Seneca Nation anticipated the law would result in 1,000 jobs lost on its territory alone. Perhaps most significant, Congress has not been able to address the devastating 2009 Supreme Court decision Carcieri v. Salazar, which limited the ability of the federal government to take land into trust for tribes. This has had wide-ranging effects on tribal economic development. The court determined Congress meant only tribes recognized by the government in 1934, not a tribe that is currently under federal jurisdiction. Land trusts facilitate housing, commercial construction and other tribal projects. Trust status ensures the land cannot be alienated and eliminates state and local taxation of that land. With the status of tribal trust land in question, external investors and businesses are wary of investing in tribal communities. Congress’ inability to enact a positive resolution results in lost economic opportunity for tribes. The interstate commerce clause of the Constitution states that Congress has the power to regulate commerce among the states and among the Indian tribes. Now is the time for Congress to reinvigorate this clause and the origins of self-determination in order to empower tribes, create jobs and honor the responsibilities of the United States toward Indian tribes. As midterm elections loom and politicians on both sides of the aisle fret over unemployment of 6 to 7 percent, unemployment on tribal reservations is nearing 19 percent. In some communities it climbs higher than 60 or 70 percent. The need for economic development in Indian Country is critical to the health of the entire country because tribal communities are part of rural America, and when tribes succeed, surrounding communities succeed too. It means more people are employed, that more capital is circulating in local economies and that the government has to provide less financial assistance to individuals to meet basic needs. Today we should recall that Nixon urged Congress to “support and encourage efforts [that] help Indians develop their own economic infrastructure.” Though Nixon left other harmful legacies, this ideal of self-determination remains just and powerful. Congress must recommit to the ideals of self-determination by enacting comprehensive legislation to further empower tribes economically. Dennis Worden is a fellow with the Center for Global Policy Solutions Greenhouse through the OpEd Project. He is a member of the Coeur d’Alene Tribe and the legislative director for the Native American Contractors Association. SACRAMENTO >> The California Attorney General’s Office asked the federal court system Tuesday to grant a temporary restraining order and other protection orders in the tribal dispute over Rolling Hills Casino. The complaint for injunctive and declaratory relief was filed in the US District Court for the Eastern District of California and also asks for a finding that the tribe has breached its gaming license contract. The complaint says the state of California is seeking emergency and other appropriate injunctive relief to prevent an imminent threat to public health and safety resulting from opposing tribal factions of the Paskenta Band of Nomlaki Indians dueling claims to control of Rolling Hills Casino. Among the relief requested is for a temporary restraining order providing any tribal faction and hired officers, agents and employees to attempt to take control of the casino and a ban of armed personnel of any nature within 100 yards of the casino or on tribal properties. The complaint also asks the court to find the tribe has materially breached its compact with the state to operate a class III gaming casino. The complaint says that compact was and is currently being breached because the safety of patrons and employees has not been ensured. The complaint quotes email exchanges from government officials and attorneys advising of the unfolding situation of the ousted Tribal leadership attempting to gain control of the casino through force. An armed “Tribal Police” left the casino grounds Monday, after a week-long standoff with casino security. 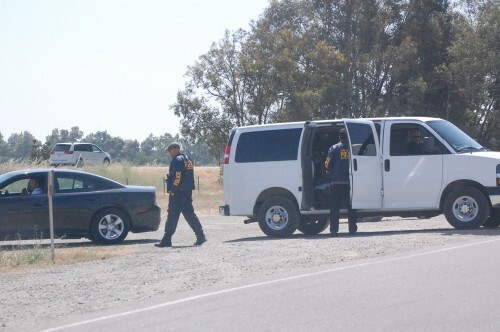 Tehama County Sheriff’s deputies have stayed at the casino since June 9. The standoff reached its peak June 11 when the four ousted members of the Tribal Council attempted to enter the casino and were kept out by casino security and about 100 tribal members aligned with Andrew Freeman. Casino operations have continued despite a cease and desist letter sent by the Bureau of Indian Affairs that recognized the four ousted members as part of the last uncontested Tribal Council. The remaining tribe has filed an appeal of that decision. Revenues from gambling at Native American gaming centers across the nation hit a new record in 2012, bringing in nearly $28 billion dollars, a 2.7 percent increase over 2011. The two fastest growing regions in the country were in Oklahoma. The Tulsa Region, which includes parts of Kansas and eastern Oklahoma, had the greatest revenue growth, increasing 6.6 percent. The Oklahoma City Region, including Texas and the western parts of Oklahoma, were in second place with gambling revenue growing 5.8 percent in 2012 as compared to the year before. 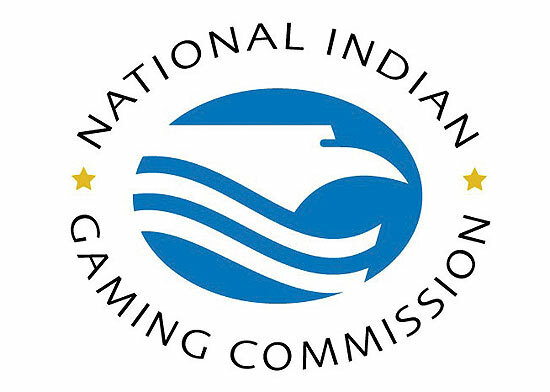 The annual report from the National Indian Gaming Commission shows those two areas outpaced all others in the country in 2012. 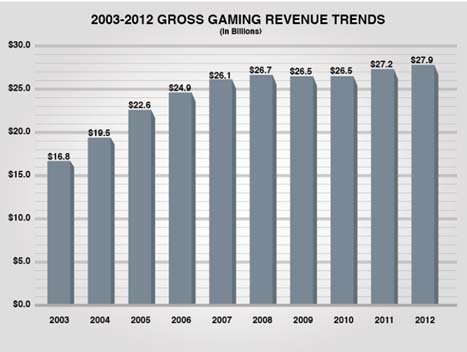 The Tulsa area showed gross gaming revenue of $1.9 billion. The Oklahoma City Region came in at $1.8 billion. 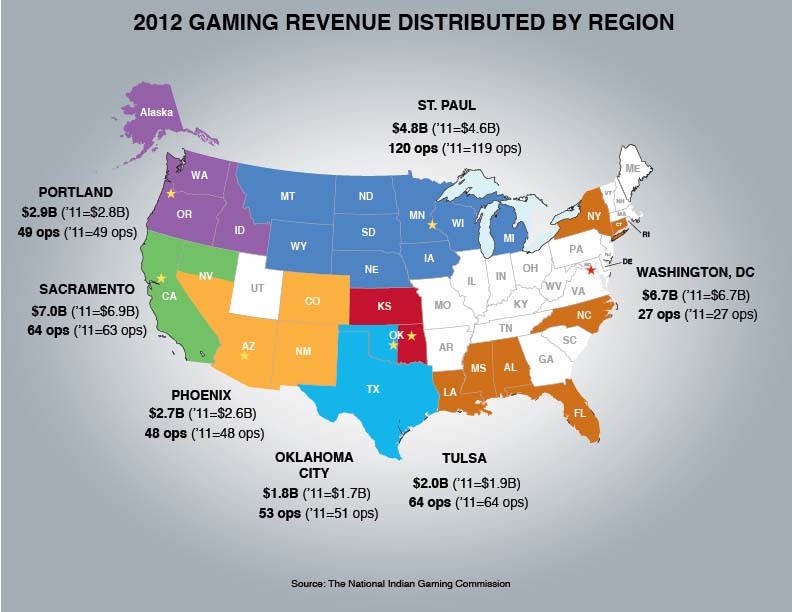 The Tulsa and Oklahoma City regions top the nation in the growth of Native American gambling revenues in 2012.